“I’m here to be me, which is taking a great deal longer than I had hoped”. I have recently written a series of posts exploring my needs. Thinking through those needs led me one day to have an epiphany, a sudden realisation of where my life was actually heading. So very clearly that day I could see that I did not want that. That direction was not right for any of my needs, for my health, my stability, my financial security, for my need to be needed. It made me take a good hard look and understand the difference between what I thought I should be doing and what was in my heart. So in an instant I decided to take my life in another direction, albeit that it may take me some time to put those desires in place. I DO NOT WANT THIS! Fair enough. I have now stated what I do not want. It has taken an absolute crisis and eighteen months of soul-searching to finally realise and state what I do not want. What is it that I do want? My needs have been explored. 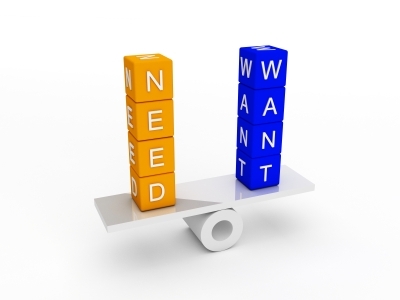 Needs are distinguished from wants as a deficiency of needs causes a negative outcome. Wants are extra to our needs. We can live without them. If I found it difficult stating my needs, then exploring my wants makes me feel truly self-centred. Yet, divorce and living alone gives me that luxury of being able to do that. So here goes. I have come to realise that my wants are not than far removed from my needs. They are not selfish or over-indulgent. The greatest challenge for me is to actually prioritise as my responsibility the fulfilling of those needs and wants, and accepting that it is all right for me to do so. This entry was posted in Choices, Divorce, Needs, Quotes, Responsibilities and tagged Acceptance, Human needs, illusions, peace and contentment, Respect by elizabeth2560. Bookmark the permalink. Follow your bliss, and you will have all that you want and need beyond your wildest dreams, Elizabeth! You know Elizabeth, you have a lot to teach people. I wish I could sit with you and talk away the afternoon with you while enjoying coffee or wine or cheesecake! PS. “The diet” is a LONG story….. I think you boiled down nicely what real “wants” are – we can list things, but they are really a means to an end, looking for the real things like inner peace and respect. No matter how we come to this place of realizing we have a right to have needs and wants – it is a wonderful place to come to. Thanks so much. I will acknowledge this in a week or two. I am humbled you thought me worthy of this award. You are more than welcome and more than worthy! I’m finding that experience is making me constantly re-evaluate my wants before they turn into shoulds. Yes, what an important distinction to appreciate! I define ‘need’ and ‘want’ regularly for my son. “We need more honey!” he yells from the kitchen, etc. I constantly remind him we don’t need half of what we have, and we are fortunate. The distinction between ‘want’ and ‘need’ is a fine line that can make or break your way in life sometimes. Understanding the difference can be enlightening. thanks for stopping by. I really appreciate it. 6) is her post: http://www.bubsyd.wordpress.com/2013/04/06/32-years-is-a-long-time/. And my 5/13 abbreviated WSon comments in..
9) Your xH abandoned a GEM, elizabeth2560! When you’re fully healed & are no longer in love w/yr xH, a DESERVING..
10) gentleman will thank his Higher Power to have the opportunity to treat you like the Sparkling Diamond that you are! Thanks for your positive comments about me. It is very hard sometimes and one feels so alone at times. It is uplifting to get comments form people to my blog who relate their own stories (so that I know I am not alone), and who also make me feel valued. You have a story to tell and you should start your own blog. I must admit that the furthest thing on my mind at this moment is another marriage. 12) If you feel differently in the future, OurTime.com, eharmony.com, etc., are BRIMMING w/dating & marriage prospects!